Five different sets of architects collaborated on the plans for Peterborough Lido with the town’s architects jointly responding to a council led design competition held in 1933. No fees were charged with the work being undertaken for the good of the community. Distinct in its design with a colourful range of building materials and finishes, the main pool is 55 x 20 yards and is bordered on three sides by poolside buildings with rooftop terraces, two corner pavilions and a square clock tower. 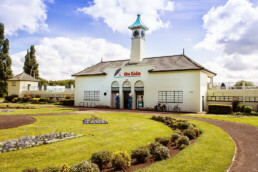 The lido has been regularly refurbished by Peterborough council, was designated as a listed building in 1992 and is run by Vivacity, Peterborough’s independent sports and culture charity. 50m main pool, teaching pool and paddling pool, heated and open seasonally. 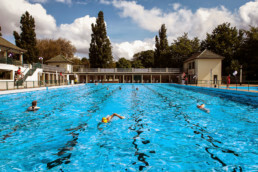 The lido also has sun-bathing terraces, a large grass lawn, children’s play area and a cafe. The lido received a direct hit by the Luftwaffe on 8 June 1940 during the first air raid on the city but was quickly restored after the war. In 1973 a tunnel was found next to the boundary wall of the lido – it seems that children may have been attempting to break if for free swims! It suffered fire damage in the 1990s leaving a huge repair bill that was paid for by the then Leader of the Council, Cllr Neville Sanders who dipped into his own pocket to cover the costs. 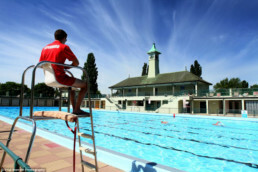 The lido continues to operate as a summer leisure facility for the local community and surrounding areas welcoming around 20,000 visitors each season.